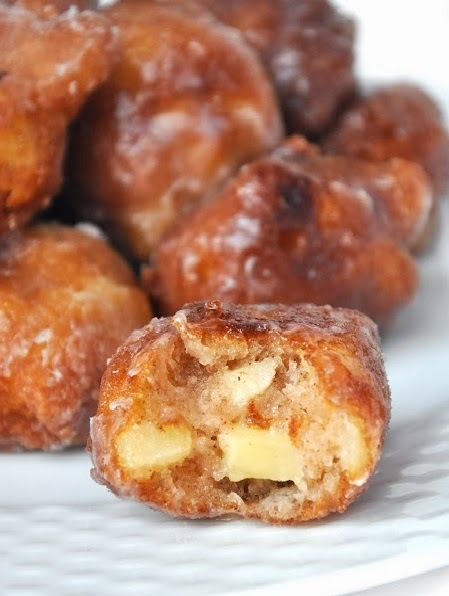 I would describe apple fritters like sweet pieces of apples that have been coated in cinnamon and sugar goodness, fried and then sent straight from heaven. Seriously though, for ALL the cinnamon lovers out there who also happen to love a good, juicy, and crisp apple, this recipe was MADE for you! It takes less than 15 minutes to put together and if you can get past all of the calories from “frying” these little nuggets of deliciousness, then you will be enjoying sugar comatose in no time,, I suggest that you make them for your family or friends and just try one (or seven) yourself, just make sure to cook them when everyone is already there. This is of course for 2 reasons, to serve them warm and to keep you from eating the whole dozen or so yourself. Mix all dry ingredients together, slowly add the wet ingredients minus the apple. Carefully mix until well combined but not overly beat,gently fold in apple pieces. The batter should be the consistency of a light cake mix. Once the oil is ready (when a test drop of dough floats to the top of the oil, a drop of water sizzles, or a piece of white bread browns in 60 seconds) then using a cookie scooper or soup spoon, place a 4-5 balls of dough into the oil. Be careful not to overcrowd and watch carefully for the underside to turn golden brown, then gently flip over and continue frying until done. I cooked mine about 35 seconds per side, but they were the size of golf balls – adjust cooking times based on size of fritters and temperature of your oil, ideally around 365° F. It is always a good idea to test one to ensure it comes out like you are expecting.